Are you still following a generic resume format or working on the suggestions of the so called “experts”? Stop now! You are endangering your chances of securing a job with those hideous and vague descriptions that no longer work the magic that they used to. If you are an energetic and enthusiastic person, then let it come across to the recruiters. Give them the bare facts and let them be the judge of your capabilities. 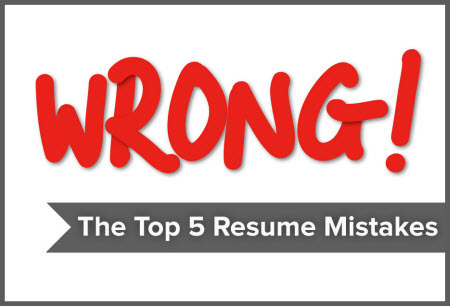 If you are committing any or all of the following resume mistakes, then you need to make immediate corrective measures before you permanently damage your chances of ever getting your dream job. Use professional resume writing services to increase your chances of selection and to make a better first impression on your future bosses. It strange but true that people can go on and on about their professional roles but even after going through the dramatic descriptions, recruiters are still not able to understand the actual professional role that the applicant is involved in. Be as clear as you can and state briefly yet accurately about the role(s) that you play in your current organization or the actual functional area that you were exposed to in your last job. Don’t keep recruiters guessing about your work. If you had to go through hundreds of resumes with fancy gibberish that makes no sense, on a daily basis, would you still manage to keep your cool? Recruiters will reject your application the moment they come across generic, stereotypical and overly dramatic descriptions. Keep these flowing words for your novel. With a resume, you should be simple, clear and effective. Sticking to this approach could actually land you your dream job. Job seekers tend to write every single detail that they may possibly come across. Well here is a revelation for you my friend – this is a resume, not a CV. Avoid paragraphs and keep things simple. Your resume needs to be a 1 page document and this is what recruiters prefer also. Try to use keywords to highlight specific sections that could help your resume to get short listed sooner. Stick to using only 2 – 3 bullet points (which are seriously more than enough) and mention only your specific quantifiable achievements instead of stating your responsibilities. Recruiters are more than aware of the responsibilities that are associated with a job profile. What they do not know is your performance and the results that have been achieved by you. Still following the herd? It is about time you stopped acting like a zombie and started presenting yourself like an intellectually gifted human being that you are. Do away with sentences such as, “Capable of solving complex strategic problems”. No one knows if the problem was related to a strategic element anyways. You just state your contribution, the outcome and the approach, and let the recruiters decide the complexity of the problem and the strategic quotient of the approach.